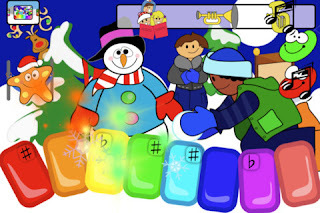 Developer Quote: "Play Christmas carols, listen to beautiful music, or make your own musical collage of melody and sound with three magical holiday themes in Christmas Kid's Piano." Kids love music and song. They can create their own music using pots, pans, keys, whistles or anything handy in the house. What really makes them feel accomplished and productive though is producing actual songs that they know and love - specifically Christmas songs! And they can do this easily on their iPad and iPhone using Christmas Kid's Piano - Festive Songs, Carols and Sounds of the Season. 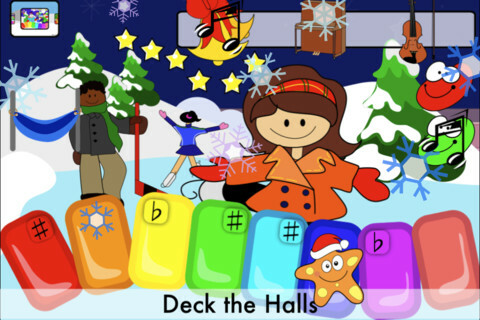 Your child will find it easy to use and enjoy this app without your help as they simply follow the directions of the starfish to play 10 well-loved and known Christmas carols. The happy smiling faces of all the characters of Christmas Kid's Piano are quite charming - from the starfish with the Santa hat to the happy musical notes. Look at the beautiful graphics including snowmen, skaters, snowflakes, packages, sparkling stars and mistletoe. Your family will be instantly infused with the wonder and magical joys of this happy season! COOL CONCLUSION: Christmas Kid's Piano is absolutely delightful seasonal entertainment for your kids, and educational as well, as they learn to tap out the notes to popular Christmas classics.